The US economy continues to attract foreign investors. This is evidenced by the fact that from 2010-16, net global investments in the US increased by $5 trillion. According to the Bureau of Economic Analysis, the US has never seen a larger or more rapid injection of foreign money – at least since 1978 when the Bureau began recording this data. High foreign investor confidence in the US economy is partly due to the economic conditions elsewhere: the slow growth rate in Japan, the Eurozone’s cohesion being put to the test and China’s slowing GDP growth, among others. 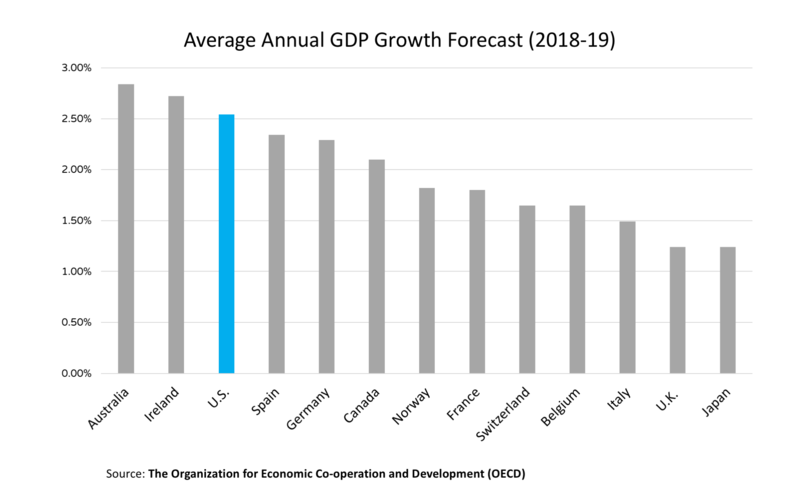 Meanwhile, the US’s GDP growth is higher than that of nearly all other developed countries and its economic outlook benefits from more favorable demographics than those of China, Japan and Europe. 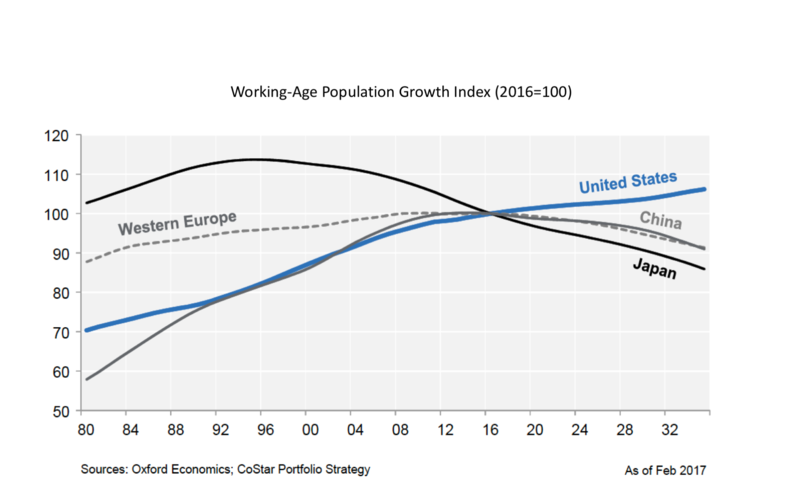 With a much younger population, the US will most likely surpass within the next decade or two other major economies in working-age population (even with a potential immigration slow down). By investing in CRE, investors gain certain exposure to the US economy. This is in sharp contrast to S&P 500 companies, one third of whose collective revenue comes from outside the US. Investing in stocks may produce high returns over time, but stocks offer very low returns until they are sold (the average annual dividend payment from stocks since 1980 is a meager 2.6%). By contrast, when it comes to annual income, CRE has offered average returns of 7.2%. The simple reason for this advantage of CRE over stocks is that typically rent payments generate income for investors during the entire holding period – from the moment the property is purchased until it is sold. What options does an investor looking for reliable income returns currently have? Bonds provide investors with fixed income and are relatively low-risk. However, current bond yields have reached near record lows due to increased demand for low-volatility assets on the part of investors as well as central bank purchases of bonds. Meanwhile, CRE returns have not decreased recently as dramatically as those in the bonds market, in part because central banks and investors are more focused on buying bonds than CRE. Another advantage of CRE investments over bonds is that in the long term their returns increase with rental rates, whereas income from most bond investments is fixed and its real value decreases over time with inflation. The contribution of regular income to CRE investment returns makes the asset class less risky than most. During economic recessions, commercial properties typically continue to generate more rental income than operating expenses. This of course does not mean that CRE never generates negative returns - during the crisis of 2008-09 real estate was after all severely hit. However, during other periods of economic downturn (for instance 1980-82 and 2001-03), while stocks experienced severe losses, real estate returns remained positive due to the steady income supplied by rental payments. The table below shows that since 1980 average annual returns in CRE returns have been nearly equal to those of stocks. And yet the volatility of returns in the stock market has been much higher than the volatility of returns in CRE. 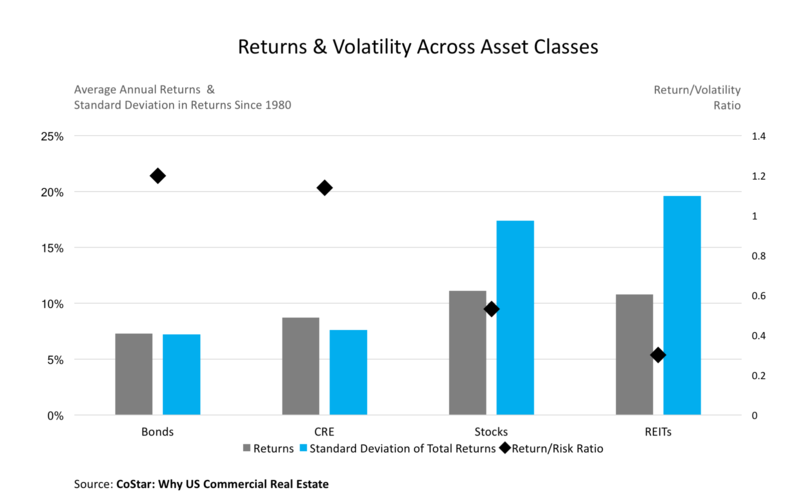 What’s more, the ratio of return-to-volatility of CRE is substantially higher than that of both Stocks and REITS. This means that while the average returns in the two asset classes are nearly equal, stocks are much riskier than CRE. Modern Portfolio Theory is a theory on how risk-averse investors can construct portfolios to maximize expected returns based on a given level of market risk. (Market risk is the possibility of an investor to experience losses due to factors that impact the overall performance of the financial markets in which he is involved due to such sources as recessions, political turmoil, changes in interest etc.) According to Modern Portfolio Theory, one can maximize returns for a given level of risk by combining different asset classes that perform differently from one another over time. CRE’s historical performance shows long-term returns on a par with other major asset classes, but its income-generating feature (one that is relatively unique to real estate) contributes to its performing differently from other major asset classes with little correlation to the performance of stocks and bonds. 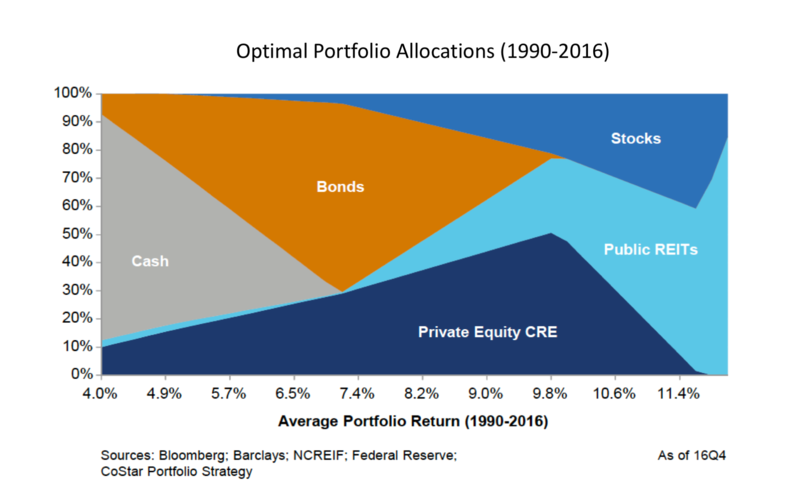 The following graph shows the optimal allocations of CRE and other major asset classes, allocations that, given the historical risk and return profiles of each class, minimize portfolio volatility for any given level of target return. The Y axis shows the proportional share of each asset class in a portfolio, while the X axis shows the average return of portfolios with those asset class allocations between 1990 and 2016. The graph indicates that for most investment portfolios to minimize volatility in returns significant allocations to CRE are required. The only investment portfolios that required allocations to CRE below 15% are those with either extremely low or extremely high target returns. 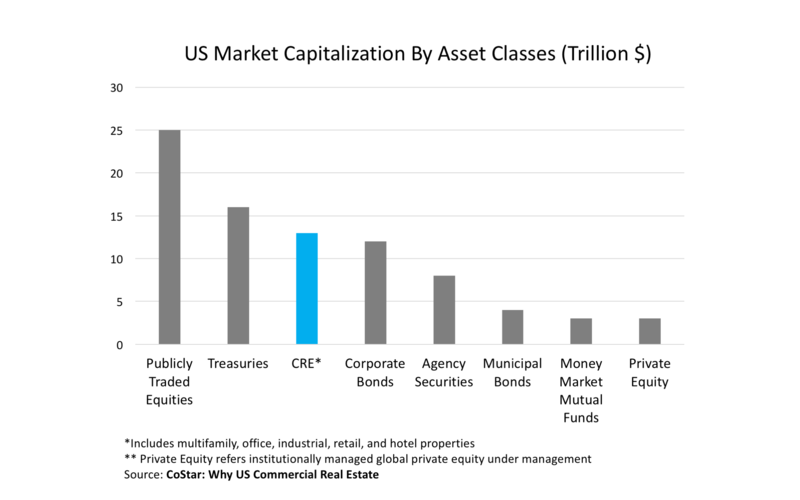 US CRE is also a substantial asset class, whose market capitalization is approximately $13 trillion (or above $17 trillion if specialty property types such as sports stadiums and healthcare facilities are included). The class is extremely diverse in terms of both geographical location and property type. Given the size and diversity of the asset class along with its other key advantages - maximal exposure to the growing US economy, high income-driven returns, and a favorable risk/return profile - one would expect CRE to be a part of most investor’s portfolios. Due to high barriers to entry CRE appears on fewer investors’ portfolios than one would expect. CRE investments generally require a larger amount of capital as well as a high level of market and professional expertise. The knowledge and real estate management requirements are normally outside the average investor's proficiency level. The result is that despite its attractiveness, CRE has been simply inaccessible to most investors, even those who are accredited. iintoo, as a highly reputed REIMCO (Real Estate Investment Company), has recently began giving investors access to commercial real estate investment opportunities. Investors can join iintoo and purchase equity shares in commercial real estate starting at $25,000. The global company’s offerings are characterized by projected annual returns of 12% and up, and are typically short term (two to three years). Additionally, most projects involve renovation/upgrade of income-generating assets (such as multifamily rental properties), which provides investors with passive income. The path to becoming a sophisticated investor with a diversified portfolio begins with commercial real estate and iintoo makes it possible to overcome the hurdles involved.